The Ouro Prêto area in Minas Gerais, Brazil is the source of the valuable topaz known as Imperial Topaz. This rare topaz is golden-orange to orange to pink, pinkish-red or violet in color. Fine specimens, especially in larger sizes, are sought after by collectors. Imperial Topaz is especially valuable when it shows a hint of pink. 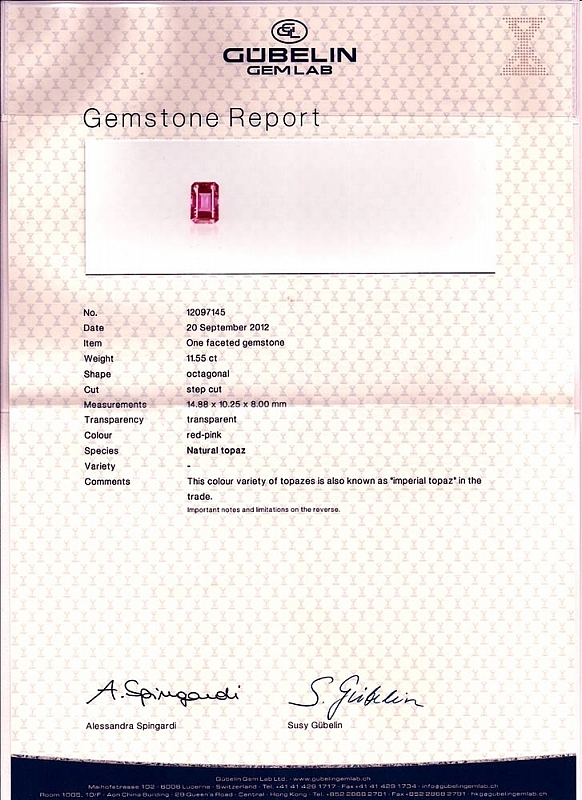 A thoroughly red Imperial Topaz is the epitome of this rare variety, and is hardly ever seen. In mid-2012 we had the lucky opportunity to acquire such a gem, the 11.55 ct Red Imperial Topaz pictured above. 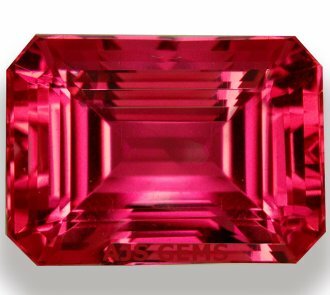 This red Imperial Topaz from Brazil is a world-class gem, combining amazing color with nearly perfect clarity and precision cutting. View our video below to appreciate the brilliance of this remarkable stone. This extraordinary gem was certified by the Gübelin Gem Lab in Switzerland as a natural Imperial Topaz with the color identified as "red-pink." While this gem was undoubtedly one of the prides of our collection, we sold it to a private collector in November 2012.